What are the hearing requirements for a DOT physical? I’m a CDL driver and my concern is I’m getting hard of hearing as I get older. If I’m unable to hear a whisper at 5 feet, will I be unable to drive a commercial vehicle? Is there a waiver I need to get? What do I need to do that will allow me to continue driving? Can I get a DOT medical card if I use a hearing aid? The driver must be able to perceive a forced whispered voice in one ear, the better ear, at not less than five feet with or without the use of a hearing aid. If the driver fails the whisper test, the medical examiner will refer the driver to have an audiometry test. The driver must pass an audiometer test before the medical certificate can be considered. All you will need to do is get hearing aids and the examiner will indicate you need to wear your hearing aids to pass the DOT examination. This does not place a time restriction or limitation on your DOT certificate and you won’t need an exemption. Yes, as long as you can perceive a forced whispered voice in one ear, the better ear, at not less than five feet with or without the use of a hearing aid. If you use a hearing aid for the DOT physical, then you must wear that hearing aid and have it in operation at all times while driving. Also, you must be in possession of a spare power source for the hearing aid while driving. im hard of hearing in both ears and i barely passed forced whisper in one ear. failed in the other. ive ben tryn to get hearing aids but my insurance doesnt cover it. its $5000 for both ears. $2500 for one. i cannot afford either. im stumped on what to do. amplifiers are useless. if i cant get one i loss my job? is there a law about providing employees with disabilities the equipment to do there job? i got a family to support. if i spend the money on a hearing aid i wont be able to pay my bills nor feed us. FMCSA wants you to be able to hear a forced whisper, in at least one good ear, with or without a hearing aid. Make sure a man does the forced whisper test. Females have a very high frequency vs a man’s lower tones, even in a whisper. Does the hearing aid have ro be prescribed? Can it be store bought? If it is needed and works for you, then your good. It does not have to be prescribed, but it’s helpful. The regulation states you have to carry back up power for the hearing aid in your possession. What if you’re hearing aid is rechargeable not battery powered? Some of the new ones are going to a charging station at night while you sleep as opposed to a replaceable battery. That should not even raise a question by an examiner. My job does not require a CDL only a regular license in California but it does require all drivers to pass DOT physical. I am profoundly deaf. California DMV says they have no hearing exemption from the physical because the job only requires a regular license. FMCSA says the same. How do I pass the DOT physical then? I have been sent around several times and no one seems to answer my question. Please help. Your standard driver’s license should already indicate the need for a hearing aid. That is all the CME needs to know, then he would mark the same thing on the medical card. Explain that you are not a class a, otr driver, and that you fll under the state’s licensing variencies. The standard license does not require a hearing aid. Deaf people can drive without a hearing aid. I cannot hear with a hearing aid either so it would not help. Again, the job does not require a CDL but requires a DOT phsyical test because of the weight of the trucks they drive. FMCSA, however, provides hearing exemptions only for CDLs. It just does not seem to make sense. Then explain your driving duties and make sure the examiner understands the FMCSA regulations, as well as your states variances. Then you should not have any issues. Each federal DOT examination performed is reported to the FMCSA. Regular nurses that give tests, are not specicalist, doctors want you to fail, because they all sell aids. even if the place you go to, is not a regular business, they still sell aids on the side. The clinic that you’ve gone to, might not even no that they are selling aids on the side. Have had my CDL for 38 years, 35 years accident & ticket free so, went to California DMV to turn in my physical. Missing 4 fingers, two on each hand and been driving this way for many years but, I still was nervous about Doctor clearing me. I was able to pass his hand use test. Have also started wearing hearing aid for the last year just to help me hear better not because I am death. Passed the whisper test at 8 ft. Doctor passed me with no limitations for 2 years, but DMV decided they know better than the DOT Doctor and are mandating that I take a driving test. No not for missing half my fingers but for wearing hearing aids even though my Doctor passed me. This DMV here in California has decided I need to drive with a qualified tester around town hoping to find a first responder with sirens going or a train crossing to see if I can hear it. I asked and purposely clarified it wasn’t my missing fingers or my eye glasses I wear, and they said no. its strictly because they must add hearing aids to my license requirement like my glasses I must wear and, if I pass this driving test they will not allow me to drive out of state and requalify every year. How can a ride along tester possibly know more than a Physician when it comes to site or hearing? I could have understood the drive test for the missing fingers maybe but hearing? Any suggestions on how to avoid this test drive? I am not presently employed so I have no vehicle to test in and was just looking to find a part time job shuttling trucks around to earn money for this crummy unaffordable health care system we have. Welcome to the republic of Calif. It seems to be a state thing and not FMCSA, so we have no guidance to lend here. Why do people still say “DEATH” when they mean “DEAF”??? As long as it allows for proper hearing and raises no safety risk, you should be fine. I drive for adm trucking. I have cochlear implants and passed dot physical.. it all good. My husband got tested and needs a hearing aid but it’s gonna take some time to get a referral to a specialist my question is if he can just go buy a hearing aid himself and get tested? He already paid the dmv and we don’t have that much time to wait for a referral and then an appointment that might take months. As long as he can hear a forced whisper at five feet with his hearing aids in, then he would pass the DOT medical examination. FMCSA is not concerned as to where the hearing help came from, but he must have them with him and use them during the examination and it will be noted on his medical card that he wear them while driving. I took the DOT exam in California and heard the whisper in my good ear but not in my bad ear. They asked if I had hearing aids, I did but barely use them since I can hear so well in my good ear. I had an audio gram that showed I have the required hearing in my good ear but the doctor said he couldn’t pass me since I’m completely deaf in one ear. Now I have a one year certification requiring hearing aids. Should I have passed without hearing aids? If so, where can I get a valid second opinion? I haven’t worn hearing aids and am not used to them which is why I’m asking. Thanks for taking the time to review my question. You should have passed, not sure why you only got a one year and the need for the hearing aids is useless unless it improves your hearing. Valid second opinions should come from any other CME on the national registry or check for DOT Physical Doctors in California. I took the DOT exam in California and heard the whisper in my good ear but not in my bad ear. They asked if I had hearing aids, I did but barely use them since I can hear so well in my good ear. They gave me a one year certification and required that I wear hearing aids. I haven’t worn hearing aids and am not used to them, am I able to ask for a second opinion? The Chiropractor said I passed the forced whisper at 5 feet hearing test out of both ears. But he said I had a wax buildup in one of the ears. He said he could not pass me because of this, even if I passed the hearing test part. I had to pay extra for him to flush my ear. He said it was because the ear drum was partially occluded. Is there a such a thing, or if you hear the forced whisper you pass? Never heard of a chiropractor flushing out ears for a DOT examination. If you passed on the one hand, then you passed. Ear flushing is not a part of the DOT examination. So ??? A number of our guys are getting 3 month cards due to sleep apnea, is the hearing test required each time? Your guys are being taken advantage of by someone who does not understand the FMCSA rules, regulations, and guidelines. Yes, hearing test is done each time you are tested. What if I am deaf in left ear? As long as you can hear a forced whisper at five feet with your right ear, you will do fine on the hearing test. What if you can hear the forced whisper and pass the DOT test but a previous audiometric test says you cant hear in one ear, which is legit and which is taken as legal, when the whisper test turned out fine and you the driver now has a medical card but the driving is put on hold due to the previous audiometric test? Hearing a forced whisper at anything greater than 5 feet with only one good ear will pass a DOT medical certification examination. There should be no hold, unless the request is only for the CME’s documentation requirements. I am completely deaf in one ear however the hearing in my other ear is excellent. Will I be able to keep my CDL if I pass whisper test on only one ear ?? If you only need to pass one ear than why do they test both? Perfect hearing in one ear will pass the DOT medical examination. Why test both, confirmation as to whether a hearing aid would be beneficial. I’m sorry, I didn’t realize you meant posted Q & A by readers. My question is answered. I really do not understand why an ambiguous word like PERCEIVE is used, instead of the straightforward word UNDERSTAND…typical government doublespeak! And yes, it is BS, as others have said. For safety, a driver needs to “become aware of” sounds around him/her. To “hear” a whispered word, but not to understand it, is all that should be required for safety. Understanding is irrelevant! A person driving with the windows up, A/C running, and music turned up loud wouldn’t hear an ambulance siren in the lane next to him/her. I may be late in this question but I think I can explain “perceive”. In my classes we are taught that perceive means to not just hear the sound, but to understand and know what it is, especially with speech. People can hear someone speaking and not understand it and this creates huge problems. They must hear it and know what they are saying. What does the word perceive mean? become aware or conscious of (something); come to realize or understand. Become aware of is not the same as understand. A person can become aware of the “forced whisper” (whatever that is), but not understand what is whispered. Class (8) vehicles all have led warning lights on there instrument panel, to put this another way, you don’t need a perceived whisper to drive safe, however you do need good vision. I’ve been driving class 8 trucks for 53 years and have no violations to date as of this posting, my hearing has been compromised due to early class 8 trucks that had very little noise abatement protection, moreover the, (American hearing association) an advocate for the the hearing impaired, concluded drivers with hearing impairments are among the safest drivers. In conclusion I think most drivers in any category are safer because they have their eyes on the road not hearing loud music on the radio ! I am a school Bus Driver in the State of Indiana. I have lost 100% hearing suddenly in 1 ear. Am I leagal to Drive Bus. I have 100% hearing in the other ear. Been CDL B driver for 20 years in Maryland. Moved to Florida late 2015. Diagnosed with Meniere’s in right ear in Oct. 2016. Had the Microwick procedure performed and ringing in ear has cleared up. DOT doctor said that because I was diagnosed with Meniere’s, that there is a possibility that I could get Vertigo and he must revoke my DOT medical card and CDL license at this time. Because of this, I will lose my job. Have not had an issue at anytime with Vertigo. You need to make sure that you were diagnosed with Tinnitis( ringing in the ears) and not Menieres. What is the deal with this whispering hearing test, that’s the biggest bunch of crap I have ever heard of. The only people that whisper are the trouble makers. When in the hell when you’re driving to do hear a truck horn whisper or a car horn whisper even a train how about an ambulance or cop car even your wife doesn’t whisper, this is the biggest bunch of BS I have ever heard of. Talk in a normal voice and everything is fine!!!!!!!!! As a CDL holding Truck Diver for 40, I have had hearing lose where I have had to have hearing aids for the last 30 years. I noticed that I was not hear as well with hearing aids in. Went in to have an audio test for up grades. This is what they found my right ear has a speech discrimination of 40 with an average decibel loss of 83 and my left ear has a speech discrimination of 60 with an average decibel loss of 85. In the retuned info issue/contention statement says “Individual Unemployability” never heard this before went to DOT and State Patrol and they can’t give me an answer as to what I can do from here. Does this mean that I’m done as a CDL Driver? Thanks for your assistance in this matter. With your hearing aids in, can you hear a forced whisper in at least one ear? If so, then you still pass the DOT medical certification examination. If not able to hear a forced whisper then you might want to check into intra-state only driving. That would put you under the states variances and not FMCSA. Is this with or with out hearing aids? It appears that, based on your answer, that you should check into either a hearing waiver from rhe Federal DOT, or intra-state driving. Intra-state puts you under the states variances and not FMCSA/Federal regulations. Force whisper is not allowed aided. Aided requires that when tested wearing your hearing ads you have to have a pure tone average of 30dB or better in one ear and 85% discrimination or better with hearing aids in and at 65dB in sound field presentation level. So you either can purchase stronger hearing aids to pass the requirements or consider obtaining a cochlear implant which when tested you should pass after implanted. Most Audiologist give you a 30 day trial period so you would have the opportunity to see if the stronger hearing aids will help pass the testing before considering the implant. The implant is not a quick fix it is a surgery and the implanted device that takes months to acclimate to. If you cannot afford new hearing aids I suggest contacting Vocational Rehabilitation services for your state. They help in these matters. I am 35 years old and have a commercial driver licence. I was born with only one ear (left) and am hearing fine. My concern is if I can drive a commercial vehicle. You will be fine as long as you can perceive a forced whisper at 5 feet in your good ear. On the whisper test i could hear the doc but could not repeat what she was saying. She had a heavy accent. My question is do i just have to hear her whisper or do i have to be able to repeat what shes whispering. You need to hear and comprehend what is being said. Unfortunately most women have a higher pitch than men and it is a bit more difficult to fully understand what they are saying. See if you can have them repeat in a little deeper voice, that would be a big help. Can you please provide a DOT definition of “perceives”, “forced whisper”, and “average hearing loss”? An audiometric hearing test does not expect a CMV driver to comprehend what the tone means, and by the same token, neither should a forced whisper test. Adding progressivly stricter and stricter definitions to the word “perceive” is a typical form of age descrimination. Can you still pass a dot physical of you are be treated for an ear infection / ruptured tymphanic membrane? Once you have healed from the injury/infection, you should be OK.
My husband has the understanding that if he gets tubes in his ears it will make him unable to drive a school bus anymore. Is this true? If so, why? It will help his hearing, and won’t negatively affect him in any other way that I’m aware of. We believe he has been misinformed about his situation and how it effects his cdl. Can a driver have a dead ear in one ear and essentially normal hearing in the other and still satisfy the DOT requirements. Also does a CROS/BICOS hearing aid system satisfy DOT requiement for this type of hearing loss. One good ear is all that is required to hear a forced whisper at 5 feet. Hearing aids are also acceptable, if needed. DOT is going to be looking for a hearing test that allows you to hear a forced whisper at 5 feet. Now that can be with or without hearing aids. If you need hearing aids to pass the test, then it should be mandatory for you to use them when transporting children. But each state is different and if you are only driving school bus and do not have a class A drivers license, then your best bet is to check with your local drivers license department and see what your state rules regarding hearing are. I passed the 5ft forced whisper test. The examiner signed my new certification card, but will not give mre the certificate until I produce the results of my hearing test with hearing aids in. Is this legal? If you passed the whisper test, then why would you be restricted to produce a new hearing test? But if the CME feels the need to have you tested for further information, then he has the right to do so. The 5 whisper is not valid test, hearing doctor said how do you know 40 decibl each person talk different levels and they aren’t in sound proof booth. How do you gage whisper at that sound level. You can’t not valid hearing test , most wont pass with hearing aids in . Not sound proof and each person talks at diff. Highs and lows, same even whispers. No one can gage it at 40 decibl. This is bad test I know 20 years truck driving. Hearing aids 10 years driving semi. Never did I pass 5 feet whisper .test. always hearing doctor test.. booth..take that test with you to do dot. Clinic show you passed with hearing aid . no 5 feet test Read people it says and, or. Hearing doctor or 5 feet not both one or the other you give that to clinic they dont do the 5 feet whisper you got your test from hearing doctor they send that in with dot long form . No waiting you are good.. read on hearing test “or ” you pass one dont do both for hearing test read carefully. See, and or not both. FMCSA wants you to able to hear, so hearing aids are fine. You will need to have the examiner mark ‘must wear hearing aids’ on your medical certificate. During the testing phase they may request no hearing aids to complete the initial test. And after the test they should determine that you need them and make the recommendation that you wear hearing aids whenever you are driving. Passed the DOT Physical with my hearing aids in. But they only gave me a one year cirtification because of my eye glasses and hearing aids. I’ve had both for many years. And I’ve always got a 2 year cirtifacation. So what has changed? Nothing changed, so I would ask what other issues where present that reduced your certificate. If all else was normal, then you should have gotten a two year card. Plan ahead, obtaining an exemption takes about 6 months if all paperwork is filled out and provided correctly. Once an exemption is issued, bring it with you when you go in for your medical examiner’s card and you’ll be exempted from the “forced whisper” test. You MUST keep the hearing exemption on you at all times. If you are not sure how the process works for the hearing exemption or if you have more questions, you can contact me. I would be more than happy to help you. Please get the word out, share this information! So many professional drivers are losing their jobs needlessly. i have hearing aids and i have trouble with the whisper test on the dot med exam, i have talked to my audiology teck At the vet administration) and informed me the whisper test is unfare do to the many different levels of sound tones. what do i do as i need my driving job. Many hearing doctors say the whisper test is totally unfair to many. I agree. A high percentage of people have trouble with noise behind them and certain voices. It is NOT supposed to be behind you but beside you. It’s still a bunch of crap, but at least this may help. All of you references are to “hearing” a forced whisper. You don’t specify being able to understand what she said. I could “hear” that she was whispering just fine, in both ears, I just couldn’t understand what she said. I couldn’t “understand” the 3 words that she said, so she failed me. Is this correct, or should I have passed since I could easily hear her? See the answer in the Comments right below – for Jamelle on Dec 19, 2015. This should give you a good reference for how the test is being administered. Sorry to be such a pain in the tuchus. You clarified that the tested ear should be turned toward the whisperer…I did not realize that (my back was to her). My question was: do I have to understand the words or numbers? You used the word perceive, which means discern, recognize, become aware of… I easily perceived her whisper, but could not understand what she said. I probably could have perceived her whisper at 10, and even 15 feet. BTW-I am going to an audiologist today, but I feel that the test method and results should be clarified better to the examiners. If your audiologist can document that your hearing is below an averge of 40 decibels.. 34 in one ear, 40 in other ear, for average of 37 you passed. you need to be below 40 no matter ! I have had CDL hearing tests ever since they changed to CDLs.I moved to Kansas and still drive part time.The examiner has to be elligable to give the test.Every test I have been given in all those years they simply ask,”can you hear me”.This lady whispered two short words and even tho I answered correctly she insisted I tell her what she said.I could not distingwish the words.She failed me.I assume the hearing test to to alert us to sirens,train whistles,car horns an such.I when to another examiner,he whispered “can you hear me” and I passed.Problem is I had to pay out of my pocket the cost of two examines. I have read that Fed guidelines state that a whisper test should be given with the ear being tested turned towards the Dr. My test was given with Dr standing behind me. . Was this a legal test. I did fail the test. The test is to have you hear a forced whisper at five feet or better in at least one ear. Not sure why someone would want to play games with this simple test. If you feel that the test was done unfairly, then get a second opinion or have an audio test done by a professional and take the results back to the examiner. Also if the examiner is a female, men have more difficulty hearing high pitch sounds. Have a male administer the test and see if this makes a difference. Should not be an issue if you can hear a forced whisper at five feet with your good ear and the use of your hearing aid. I am deaf in my right ear but hear fine out of my left ear. With the new guidelines will I pass the d.o.t. physical in Texas if I can hear the forced whisper? FMCSA requires that you be able to hear a forced whisper in at least one ear, so you should be good to go. Can I take a Michigan DOT test if I am completely deaf? Each state has different rules and regulations. So check with your state Drivers License Department-DLD, and see what they have to say about your situation. Contact information for Michigan. What is the formula for calculating an audiometer test, to DOT standards? There is no formula, just testing standards from the FMCSA guidelines. I failed the whisper test wearing hearing aids and when they performed the audiometric test they had me remove my hearing aids so naturally I failed that also. I am in the process if getting new hearing aids. Will a audiometric report from my audiologist showing my hearing correction with new hearing aids be acceptable to get certificate. Or can the doctor doing physical do an audiometric test on you while wearing hearing aids? If you go in with the report in hand, you should be good to go. Did they also recommend the use of a hearing aid? Forced whisper done by a female examiner is much more difficult to hear than when done by a male examiner. What is the qualified reading from the test from the audiologist in il. I had a hearing test today but the gal couldn’t tell me what the IL standard is. FMCSA wants a five foot forced whisper understood. Now that can be with the use of a hearing aid. 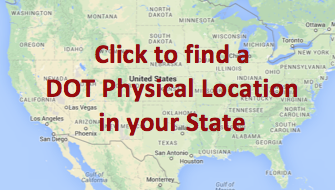 If you want to know about what your state parameters are, you’ll need to check with your state DLD. Was wondering, I only have one hearing aid, do I need to have two hearing aids? Not if one allows you to hear without any problems. Make sure you carry a spare set of batteries. Went for DOT physical and failed hearing test. I went to Audiologist and confirmed that I require hearing aids. If I am unable to rectify the problem before my present DOT medical card expires. What would happen to my NYS CDL license ? I am presently out of work from my employer until it is rectified. Can I postpone the physical with an expired medical card? And for how long? 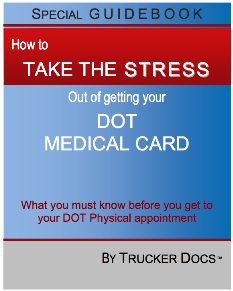 Your CDL license is separate from your medical certificate. So you should be able to get your hearing situation rectified and then get a new medical certificate without worrying about your CDL. But check with your state to confirm that you have a window between medical certificates. I live in California, and have a Medically restrictive Class B. license, for a vision issue. ( for the vision restriction I need at least 20/40 vision combined in both eyes, mine is at 20/25 in case your wondering). For the past 8 years I have been slowly losing my hearing. And so I wear hearing aids when I am at home sometimes. On March 16, 2015, I failed both whisper test without my hearing aids, and and an audio-gram test, with my hearing aids on. I had them turned down because of a feed-back issue, I passed with my left ear failed with my right ear, he laughed and told me that I was as deaf as a post in my right ear and so I failed my hearing test. OK that is the history, here is the question. Why is he applying a Non-Restrictive Class B Commerical hearing requirement, to a California Restrictive Class B License with a Medical Waiver? Already in place? Not real sure why they would have failed you. FMCSA states that if a driver can pass the hearing test, with or without the use of a hearing aid, in one ear, then he passes the examination. Best bet is to question the examiner. One ear hears OK with the use of a hearing aid passes the test. I just failed my whisper test. The “doctor” did not speak in a forced whisper, and I could barely hear him in a regular voice. This test is insane. Whispering could not generate more than 30 decibels, but a car horn is above 100. What is the rationale behind this silly test? I know my hearing is not perfect, but I can converse on a phone and talk to most people if they speak in a normal voice. Paying a fortune for hearing aids is crazy. Update: Today, after failing the hearing test administered by two more doctors, I passed using the audiometric test. Humans are inconsistent – machines don’t lie. Shop around for a price – I was quoted $90 by one hearing place, but only paid $19 today for the same test. The doctor today was also cheaper, and more professional. He also passed me on the eye test (which an eye doctor had done yesterday). I would be careful of these “truck stop” docs in the future. At my recent physical I was NOT given the whisper test first, they just used the testing device that measures to the 25 decibel range. I failed the test because of a head cold I had at the time. I have gotten over the cold and am hearing just fine but now they are telling me that Federal guidelines say that if I fail the test initially I must see an audiologist and pass a test with them before I can get my medical card. If this is true and there are no provisions allowing for temporary hearing loss because of a head cold these regulations are laughable. My question; Is it true that I must now see an audiologist? This is not a regulation/law, just a guideline. If they won’t provide you a re-test then go somewhere else. Does the person taking the CDL hearing test need to know the words that are whispered or just know that something was whispered and where the whisper is coming from? In most cases the examiner is asking a question or making a statement that requires an answer. There is no FMCSA waiver program for hearing. You might want to double check on this, because after doing some reading I have found that they supposedly have an exemption for deaf drivers so they can get their CDL, as of about September 2014. Can I pass the hearing test wearing an amplifier? I lost my hearring aids and use this to hear the TV better. If your amplifier does not interfere with the operation of a commercial motor vehicle, then you shouldn’t have any issues. I do hearing test and see driver that have passed a forced whisper test but can’t pass an aurio metric test to qualify with a 25db loss in the good ear. Why is a whisper test excepted as a good test to drive but to get a job with the prison sysyem there has to be and audio metric test. Because that’s the way FMCSA says it ought to be. Check with them. Is there any requirement that states a driver must wait 3 months after getting a hearing aid before he can be certified? No, there is no wait time. At the DOT physical exam you must be able to meet the hearing requirements with your hearing aid. I have a bad infection in my good ear, hear better from ear that does not pass exam. Am i legal to drive? If you can not hear a forced whisper at five feet from either one or the other ear, then you are not legal to drive. what if you wear the hearing aids and you’ve already told the audiologist you have to pass but still fail, then what recourse do we have. The basic test for hearing is a forced whisper at five feet. Your hearing aids with new batteries should help you pass. Also, if a woman administers the test, you may be missing her speech because you are not hearing high frequencies. Have a man with a lower voice do the hearing test. If all that fails, then you may need to check with the FMCSA regarding the hearing waiver, it’s somewhat new. I don’t have any experience with this yet, so FMCSA will be the go to guys here. I passed the audiometry test and they still would not give me a dot card because of wisper test!! How do i go about getting a waiver! I’ve had a very safe driving record for 30 plus years! If you passed the audiometry test, I do not understand why they would want to do a whisper test. The first test over-rides the second test. But you could check with the FMCSA about the hearing waiver. Before I resorted to a FMCSA waiver, I would followup with your hearing doctor and let him know that you need to be able to hear a forced whisper at a distance of five feet or better. If he is unable to get you to that point, then there is a hearing waiver from FMCSA. I am not sure how long the process takes to get the waiver. Can you be deaf in one ear and still pass the DOT physical? Yes. As long as you can hear a forced whisper at 5 feet in your good ear, you will pass the DOT examination. If you need to use a hearing aid, make sure you are wearing the unit and that the power source is operating normally.